Our newest and very special installment of the Writers Forum is an exclusive feature on Riva Ridge, Secretariat’s overshadowed Meadow Stablemate written by his Hall of Fame jockey Ron Turcotte. This illuminating insider’s look tells the history of this 1971 juvenile champion, 1972 Kentucky Derby and Belmont Stakes winner, and the 1973 champion older horse. Riva Ridge, the little horse who could, won two-thirds of the Triple Crown of horse racing, the 1972 Kentucky Derby and Belmont Stakes. He also won the Bluegrass Stakes and the Hollywood Derby, but still was not the star of Meadow Farm. By the end of the year his stablemate Secretariat had stolen all the headlines by becoming the first 2 year old to be named Horse of the Year. When asked where Riva Ridge ranked amongst all the great horses I had ridden, I answered: Riva Ridge will always hold a special place in my heart because he was great in his own right. Without offending anyone and taking anything away from Cigar, if he was a great horse even though he couldn’t run on the grass, what does that make Riva Ridge? After all, he is in the Hall of Fame too. Before I go to the Riva Ridge story, I will give you some idea of my experience from being around horses most of my life. As a youngster in the New Brunswick forest, I used to drive and care for work horses and later for horses around the racetrack, which lead to my life as a jockey. And here is what I found out. All horses are born with a certain amount of ability regardless of the breed, whether he is a draft horse, work horse, quarter horse, Standardbred or a Thoroughbred. Some are stronger than others, and some are faster than others. The idea of working with horses is the same, feed them well to keep them physically healthy and strong. But there is also another aspect to keeping them healthy. It is the one that starts at a very young age. I call it mental health. The idea is to keep them happy with love and tenderness and make them want to do things for you. That is the only way I knew, because no man could make an animal ten times his size do anything that he doesn’t want to do without all of those ingredients, or at least not do it to the best of his ability. That is for sure. Oh, some guy may get lucky now and then, but not in the long run. Only the best horsemen will keep their horses running consistently. After having said this, I will let you decide why we often see horses run one big race and come right back and run only a mediocre race. Most Thoroughbreds have the will to run, but not all trainers can keep a horse in top form. Consistency should be the name of the game. With the exception of those who get on their own horses, trainers in horse racing are, in reality, managers. The better they manage their horses, like knowing when to run them, and in which races they should run, the better their horses will run and the more consistent their horses will be. Riva Ridge really does hold a special place in my heart. You see, I did not ride Riva in his first four races. The first time I rode him was in the Flash Stakes on opening day of the Saratoga meeting of 1971, and I was so impressed by his ability, that when I got off him in the winner’s circle, I told Mr. Laurin that he was the best 2 year old I had ever sat on. That was saying a lot since I had ridden such stars as Northern Dancer, Tom Rolfe, Arts and Letters, Damascus, and the “rabbit” Hedevar. Also Rambling Road, who had defeated Northern Dancer in their only meeting before injuring himself. Mr. Laurin‘s reply was that I couldn’t be serious or that I had lost my mind because three of those 2 year olds had gone on to win one or two of the Triple Crown races as 3 year olds. But I was dead serious. Indeed, up till then, Riva Ridge had run four times with two wins and finished way back in his other two races. I then went on to explain to Mr. Laurin that I thought I knew the reason for his two losses and that I would surely love to be on his back the next time he went to the track for a gallop. The next morning I made a call to the stewards for permission to see the films of Riva Ridge’s first four races. When cleared by the judges, I went to the film room to review all of his previous races on film. The next move was to gallop him to confirm my suspicion. The day I rode him in the Flash Stakes, he broke on the lead, then ducked toward the outside fence away from the other horses. After I checked him and headed him on a straight path, he took off and pulled me to the lead and stayed on the bit. Without relaxing one jump, he ran all the way on the lead and went on to win by 2 ½ lengths in a fast 1:09 4/5. He was running like he was scared to death of those other horses. After I galloped him, it only strengthened my belief that he was a horse of exceptional ability, but very timid. If only I could teach him to relax — rid him of his fear of having other horses next to him — he would be a much better horse. As seen in his past performance lines, in his first race with Chuck Baltazar in the saddle, he broke slow and wouldn’t go past any horses and finished last, beaten by 16 lengths. The second time he ran, he broke on the lead and won by 5 ½ lengths. In his third race, he again broke on the lead and went on to win by 4 lengths. His fourth start was in the Great American Stakes, and he broke slow again, and stayed behind the whole way to finish last by 6 ½ lengths. Now I was ready to tell Mr. Laurin that I knew exactly what Riva’s problem was — he was just plain scared of being close to other horses. After I galloped him and he jumped all over the track every time a horse went by him, I was sure this was his problem and it could be remedied with time, some patience and a lot of kindness, which was something the boys and I had plenty off when it came to schooling 2 year olds. That’s when I asked Mr. Laurin if I could take the time to gallop Riva every day for at least one month to school him properly and show him that all the other horses were not monsters. I also asked him if he could refrain from running him until I thought he was ready. He said he had planned on running him in two other races before the Hopeful, but luckily he agreed that we should remedy the situation first. So we went on about our business of schooling him. At first we used two stable ponies, and after a week we started to use other Thoroughbreds every day with Charlie Davis and Paul Feliciano riding the other horses, and me on Riva Ridge. At first they galloped one on each side of me with plenty of space in between us, so as not to scare Riva and give him more confidence in himself. Slowly we started bringing them tighter together, and galloping head and head. If Riva started to fret and harden up under me, I would ask the boys for more room between us. After two weeks of galloping that way we started to push each other around on our horses to the point where our horses were brushing up against each other without Riva trying to jump forward or backing up. Our next move was to teach Riva Ridge to come from behind and go through between them, then come through on the inside, and finally to come around the outside without shying or drifting out away from the others. Four weeks later, we were ready to put all our efforts into practice and run him in the Hopeful. But unfortunately, we had to wait when Riva came down with a fever just a few hours before the race. I was disappointed, but it gave us more time to school him before putting him to the test. Riva Ridge was scheduled to run in the Futurity Stakes at 6 ½ furlongs at Belmont Park and he came through with flying colors. I eased him back of a fairly fast pace leaving the gate and going up the backstretch, and he came home from the middle of the pack to win the race by 1 ½ lengths going away. I could easily have gone to the lead if I had wanted to because he was about the fastest 2 year old I had ever been on, but I didn’t because there were longer races to think about. I took him back in all his other races as a 2 year old, and he came between, and around other horses, whichever way the race materialized, without hesitation to win all his races with ease. I wanted to keep his energy for a strong run in the home stretch and he always responded whenever I asked him. Riva Ridge went on to finish the year without any other defeats, becoming the second richest 2 year old in racing history, and he was also the leading earner for the year after winning the $153,060 Futurity Stakes at Belmont Park by 2 ½ lengths, the $195,150 Champagne Stakes by 7 lengths at 7-5, also at Belmont Park, then the $144,590 Laurel Futurity by a smashing 11 lengths at 1-10 at Laurel Race Course in Maryland. His last race as a 2 year old came in the $293,890 Garden State Stakes, at Garden State Park in New Jersey, and what a race it was! It was his first time around two turns. I took him back leaving the gate and dropped to the inside to save ground around the first turn. I then took him to the outside heading to the half mile pole to make my run. What a run! He just blew the opposition away, including the undefeated, soon-to-be Champion 2 Year Old Filly Numbered Account by 2 ½ lengths easy, at even money odds. What a Kentucky Derby prospect! He was voted the Eclipse Award for Champion 2 Year Old of 1971. I was so proud of him, not only because I was right about him and our work with him for his benefit, but because he overcame his own fears and could run from anywhere I chose to place him in his races. This way he could be rated and run at longer distances to the best of his ability, of which he had plenty. As a 3 year old, he won his first race, the Hibiscus, at Hialeah Park in Florida by 4 lengths easily. His second race was the Everglades Stakes on a muddy track, one that he couldn’t handle, and he finished fourth. This was the first time I got beaten on him. You see, that was his only problem: Riva could not handle the mud or grass. He then went on to win the Blue Grass Stakes easily, but I didn’t like the way he dropped the bit and slowed down after we took the lead at the quarter pole. He started looking around for company. Even though he won by 3 or 4 lengths, I didn’t like it. He could not see very wide with the ¾-cup blinkers that he was wearing, which had only a small slit. And being 3 lengths in front, he wasn’t able to see or hear any horses closing wide behind him. I figured he might get beat in future races by a fast-closing horse if he couldn’t see him until it was too late for him to pick it up again. The morning of the Kentucky Derby, I asked Mr. Laurin if I could cut the holes in his blinkers larger just in case I had to go to the front. Well, you should have seen the expression on his face. “Ronnie don’t you think it’s too late at this point to make any changes?” he said. I thanked him and proceeded to cut a larger opening in the blinker cups, while saying how I felt better just in case we had to go to the lead. I had heard rumors around the track and in the jockeys room that trainer Arnold Winick had bragged about playing our game and instructed jockey Carlos Marquez to take Hold Your Peace back leaving the gate and stay with me and move with me. But I knew something they didn’t know: Riva was an extremely fast horse before I schooled him to relax and come from behind. I also knew he was the best horse in the race and that I could use him as I saw fit. I was very confident because everything was falling into place at the right time. He was feeling so good and had worked so well over the track, which was dry and fast, with no rain expected for that afternoon. Everything was to his liking and I could smell the roses. As usual, Mr. Laurin’s instructions were, use your own judgment. Well, the race materialized just as I thought. A few yards out of the gate, I saw what was happening: All the other jockeys started taking a strong hold on their horses. That’s when I decide to go on about my business and took the lead. I went on to win my first Derby by 3 1/4 lengths, very easy. What a relief and what a thrill! I don’t believe there is a bigger thrill in the world for a jockey than winning the Kentucky Derby. Taking the time to school Riva paid off. I believe that I was more proud of his accomplishment than my own. Oh how I loved that horse! Just by looking in his eyes the first time I rode him, I knew he had it and he never let me down! You may laugh at me some, but I never forgot what my dad had told me when I was younger, that you could always tell the intelligence of any animal by the look in their eyes. Now it was on to the Preakness where we fell victims to a muddy track and finished fourth after slipping and sliding all over the track. He would never feel secure on an off track, or the turf for that matter. The Belmont Stakes, the test of champions, was run on a fast track. He won going away by 7 lengths. 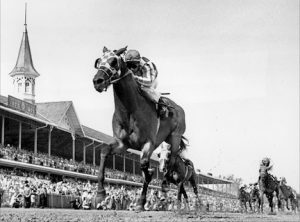 If not for the mud at Pimlico, he would have been the first Triple Crown winner in 24 years. It would have been back-to-back Triple Crowns for me the following year when I won aboard Big Red, but it wasn’t meant to be. Then again, the Triple Crown is not meant to be easy; it is only expected to be won by the very exceptional individual who can outrun his generation on all circumstances and all types of track surfaces. Now it was on to California to win the Hollywood Derby. The track was so hard that day I could feel the jarring throughout my whole body. When we returned to New York and stepped on the track for the first time, I could tell Riva was very muscle sore and the rigors of the hard campaign were catching up to him. We gave him the whole month of July to freshen up. His next race was the Monmouth Invitational at Monmouth Park, and he ran a very dismal race to finish fourth after training exceptionally well at Saratoga. This remains a mystery to me because he was so full of energy the last time I took him to the track at Saratoga before he left for New Jersey. When Mr. Laurin gave me a leg up, Riva never reacted and was so dull in the post parade at Monmouth Park. There was talk that he was drugged that day and I really believe he was. I never said anything about it, but he sure wasn’t the same old Riva I had been on in Saratoga just one or two days earlier. Mr. Laurin gave him a chance to recuperate then he ran him in the Stymie Handicap where he only got beaten a neck by Canonero ll, the 1971 Kentucky Derby and Preakness Stakes winner. The race was run in a new track record time. Riva Ridge didn’t win another race that year. He was third once and finished off the board in his other three starts, all on off tracks and turf. Even with all his victories and without a defeat on a dry track against all the other 3 year olds, he did not receive the Eclipse Award as Champion 3 Year Old Colt. They gave that award to Key to the Mint, who beat Riva in the Woodward, when Riva was fourth on a very sloppy track, and in the Preakness where we finished fourth to Key to the Mint’s third on a muddy track. I was also riding Key to the Mint whenever he and Riva didn’t run against each other, and I know Riva was the better horse of the two. He got robbed; he should have gotten the Eclipse as a 2, 3, and 4 year old. But I guess that is standard. Voters always seem to forget the first seven or eight months of every year. He was again the leading money-winning horse of his generation in 1972. As a 4 year old, Riva Ridge won five of his nine starts and set five track records along the way. In his four defeats, three were on muddy tracks or on grass. The other was a second-place finish to Secretariat in the Marlboro Cup. Riva also broke the existing track record that day while finishing second, which didn’t count since he didn’t win. This time, he was voted the Eclipse Award for Best Handicap Colt, Horse or Gelding 4 Year Olds and Up. Now you can see why Riva Ridge will always have a special place in my heart. I feel that I had a lot to do with making him the champion that he was. In the wrong hands or being asked to keep going after he won his first stakes race could have ruined him. One can only question how many young horses end up that way, or which one is the latest? Riva had the ability to run, but I think kindness and time was what the doctor ordered, and we gave it to him. Ron Turcotte is the Hall of Fame jockey who guided both Riva Ridge and Secretariat to unprecedented success for the Meadow Stable. Ron currently resides in New Brunswick, Canada and continues to make public appearances to benefit the Permanently Disabled Jockeys Fund and equine welfare-related causes. He is broadly admired and beloved in the racing industry, serving the sport as one its most respected ambassadors.